Our last week in Cotonou has been a roller coaster of emotions as we have made our final preparations to leave and return home to our family and friends. We have grown to love so many of the members and missionaries here that it has been very difficult to say good-bye knowing that we will probably never see many of them again. The gospel of Jesus Christ is true and constant everywhere and at all times but missionaries come and go as servants in the Lord’s army change. Our only prayer is that our work has been consecrated and accepted by the Lord. Most of the week was spent preparing for our departure. 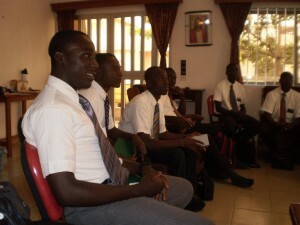 Elder Black spent his time with the final financial responsibilities. 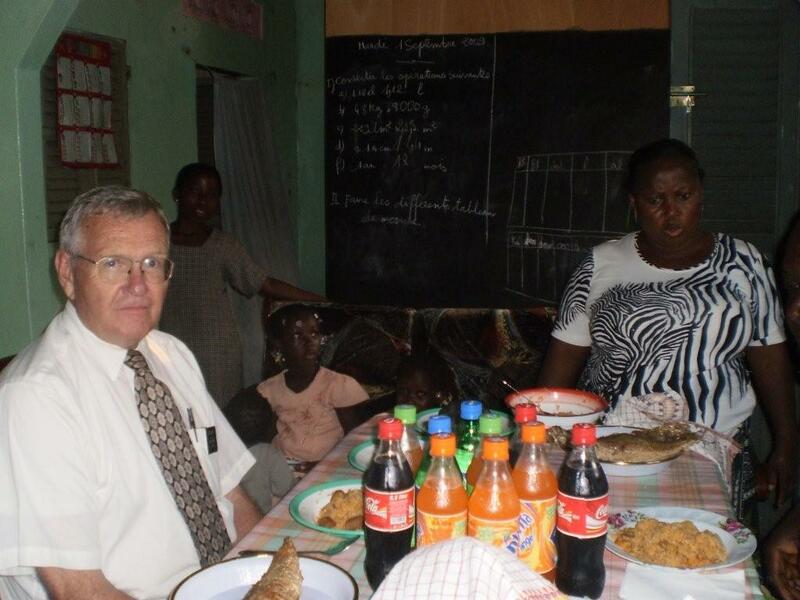 Elder Jerman will pay the bills etc., so he needed to learn where all of the places were located to pay the water, electricity, phone, internet, etc. It sounds easy enough but they are all located in different places for six different buildings, are due at different times and must be paid in person with cash. He also needed to make arrangements with the bank to make an authorized change from his name to the new couple who will be here in October. Then there was also the post office and customs at the airport where the packages arrive. The list goes on and on but when we left for Togo on Saturday he had all of this done plus audits in the branches and last minute visits with the branch presidents. Soeur Black spent the week cleaning the apartment and packing the suitcases. Both projects seemed to call for big garbage bags for things to be given away and trashed. By Friday night the apartment looked a little bare but clean and organized. The airlines has strict restrictions on luggage weight and size so the scales were in constant use trying to come up with the proper balance of weight in all of the suitcases. We are allowed one carry-on which can weigh 18 kilos and two checked pieces of luggage which can weight 23 kilos each for each of us. We have had so many gifts given to us and souvenirs that the weight added up real fast! We have developed a great friendship with President Gbedjangni (Lets hear you pronounce that) and his family. They have been members of the church for approximately 13 years, and have been instrumental in helping the church to grow in Cotonou. They invited us to dinner on Tuesday evening for one last feast of Soeur Viviane’s superb African cooking. It always amazes us to see how so much good food can be prepared on small charcoal cookers outside on the ground. As we were in our final preparations to leave, Elder Black had three harmonicas which were given to him or sent from home. He can only play one at a time so he decided to give one to Victor, their 11 year old son. 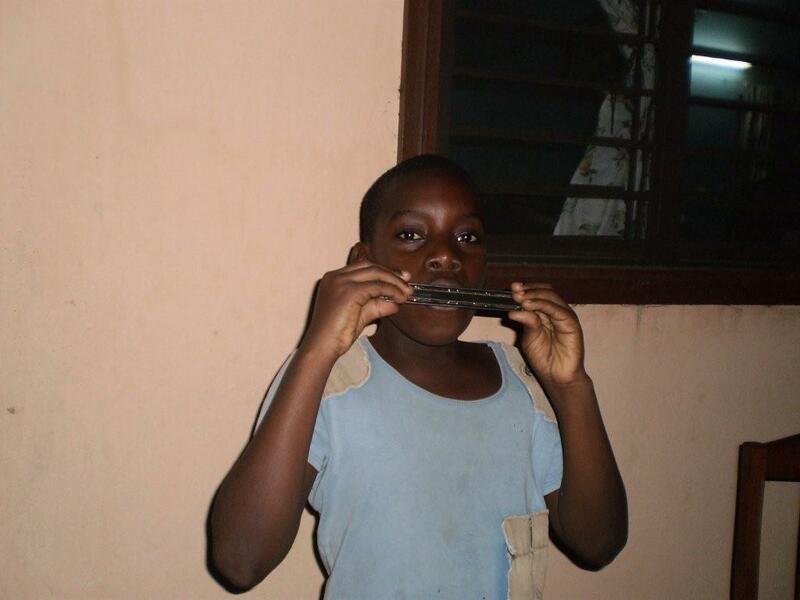 His eyes were extra large as he heard Elder Black give a demonstration of how a harmonica works. Much to our surprise, by the time we left that evening he had one stanza of “Come, Come, Ye Saints” down real well. The harmonica was given to the right person! Four missionaries were being released this week so Elder Black made a quick trip Togo on Wednesday to retrieve Elder Missegbeto and Elder Ayeoutou so Elder Ayeoutou could go back to Cote d’Ivoiore with Elder Aka and Elder Ayaman and Elder Missegbeto (be sure to pronounce all those correctly) could be back in Cotonou for their releases. 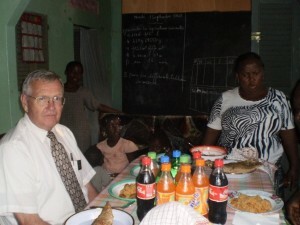 On Thursday afternoon we invited the missionaries over to help clean out the fridge and have a little farewell party. 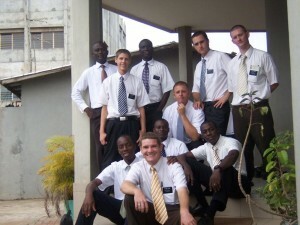 Of course, the missionaries were more than happy to help us with that project. There was a big container of frozen spaghetti sauce in the freezer which disappeared quite quickly plus other mismatched items from the fridge. What was left we boxed up and sent across the street with Elder Jerman and Elder Kpagnni. 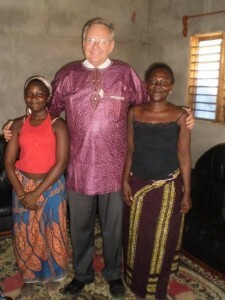 We have also become good friends with Pierre and Rosemond Aggasain and their girls. Pierre is a good person to know. He is one person in Africa who knows how to do things. He is a carpenter by trade and does some beautiful wood work which has made the chapels look a lot better. He also did all the remodeling of the new building when we got it and generally knows where to go to get most anything accomplished. They invited us over for an authentic African meal on Friday evening. They served rice jolof and fried fish followed by pate rouge and a sauce. It was absolutely delicious and a good one to remember African cooking with. Rosemond sells fish at Tokpa marche and goes to the port every day for fresh fish so the fish was fresh and cooked to perfection. Their two older girls, Elizabeth and Cecilia, were two of the dancers at our going away party the previous Saturday. Then there is the little Pierrette. When she was born we were with her a lot. Now she is a year old she screams every time she sees us. Lately she has been getting more friendly, however, and before we left on Friday we actually got a smile out of her. Saturday morning we left the apartment with our suitcases and memories and headed for Lome. We needed to stop and see a couple of members on the way so we took the long way to Lome via Calavie to bid farewell to Soeur Juilianne. Cotonou would not be Cotonou without several major traffic jams on a daily basis and we found ourselves in a “doozie”. It seemed as if everyone in Cotonou was headed for Calavie and everyone in Calavie needed to be in Cotonou. With the road construction and trucks, motos and cars on the road there was plenty of horn honking and near misses. We eventually made it to Soeur Juilianne’s home for a nice little farewell visit. She had made a beautiful boomba for Elder Black which fit him to perfection. This is another family we will miss very much and have certainly enjoyed going there during the past year. Juilianne is a beautiful seamstress and you may recall the she is deaf and is an expert at reading lips. The only problem is that they must be Fon lips so we have always needed a translator. We always tried to have a Fon speaker with us but her daughter Josianne speaks French so she was the translator this time. About eight hours after we left our Cotonou apartment for the last time we arrived in Lome on Saturday night. The couple’s home there is quiet and peaceful and we literally collapsed but were ready the next day to finish our responsibilities there.